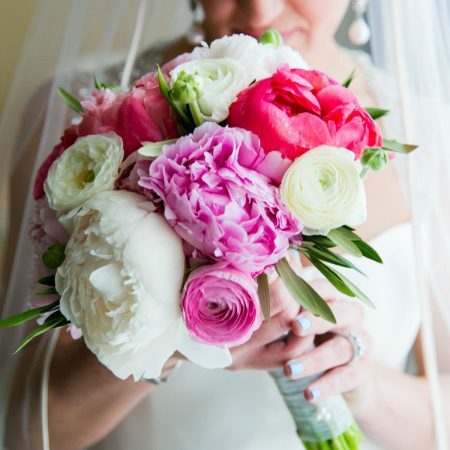 Peonies are recently the perfect touch for a modern early summer wedding! They embody love and prosperity with the good omen of good fortune and a happy marriage, making it a perfect choice for brides to use on their special day. 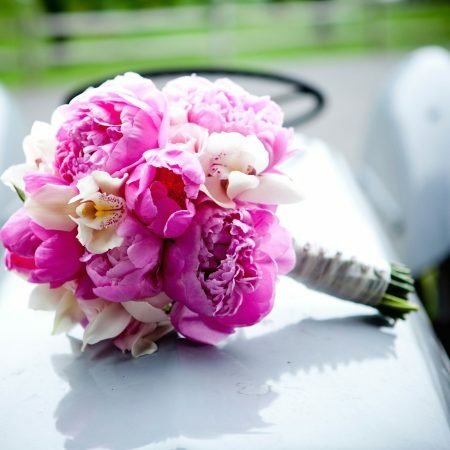 Unfortunately, Peonies aren’t available all year long so it’s best to get them between May and June making them a perfect choice for spring-summer weddings! It can last through all types of weather conditions, meaning even if your wedding day will be hot or windy, you can count on your peonies to keep looking beautiful. Peonies are often best on their own but they can be mixed with other spring flowers to create a dramatic but chic arrangement. 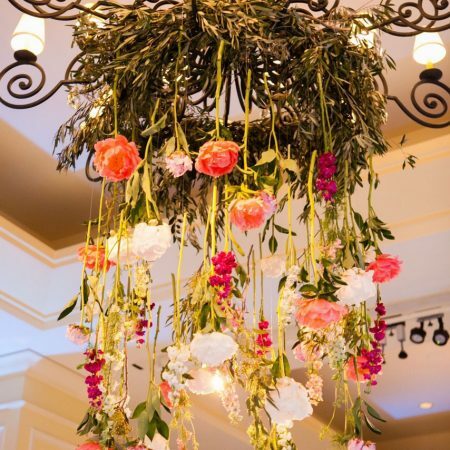 Here are some of the top wedding trends with these beautiful flowers! Floating Peonies: Since it has such a lush, dome shape bloom, making peonies look effortless and stunning in this arrangement. Place big blossoms with stems cut an inch below the bloom and float them in a considerable sized bowl filled with tepid water, but remember, less is more! Bouquets: This type of flower will add a lovely, fragrant touch to your bouquet. 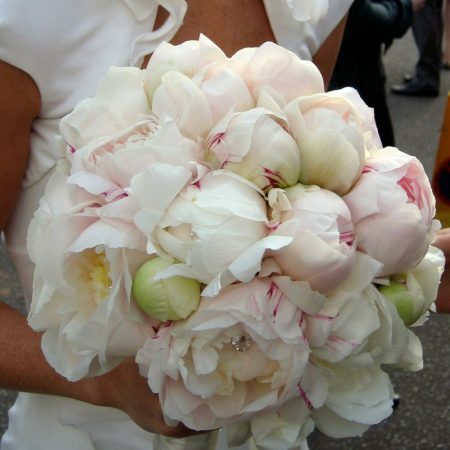 With peonies large variety of color choices, it will fit any wedding theme you have planned. 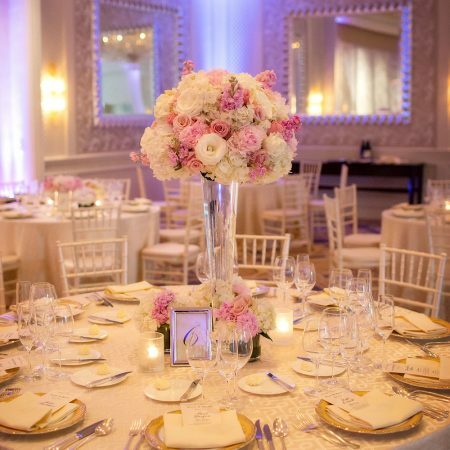 From hot pink peonies to give a more colorful and bold look, to soft pink and white blooms for more of a romantic and classic feel. 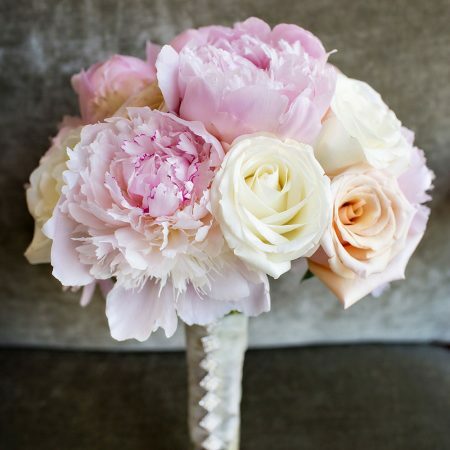 Peonies bouquets can also be minimal since they stand on their own very well but whimsical with other flowers. It can also be arranged with accents like a satin ribbon or hemp wrapping these flowers up for the perfect finishing look. 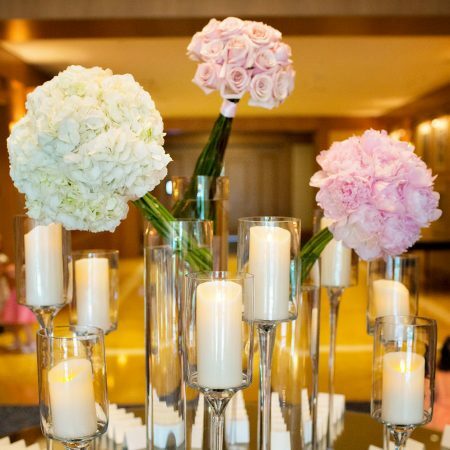 Table Centerpieces: Everyone loves looking at the big ruffles of the peonies blooms and brides love that it comes in many different hues to match their vision. From a range of soft and pretty to bold and seductive to traditional and feminine. 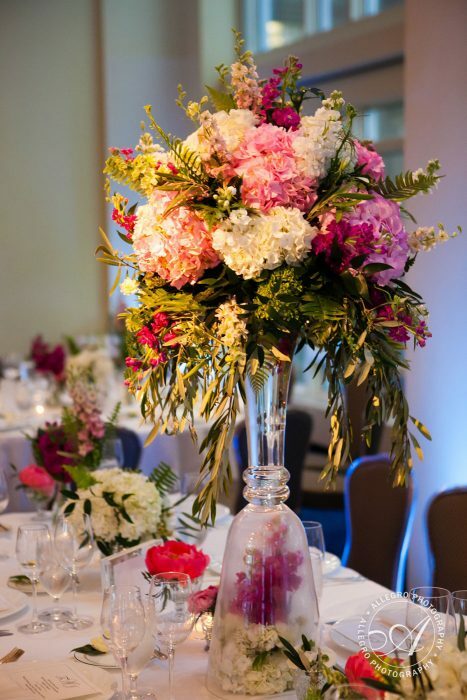 A few blooms in a simple arrangement can instantly take you table to the next level! 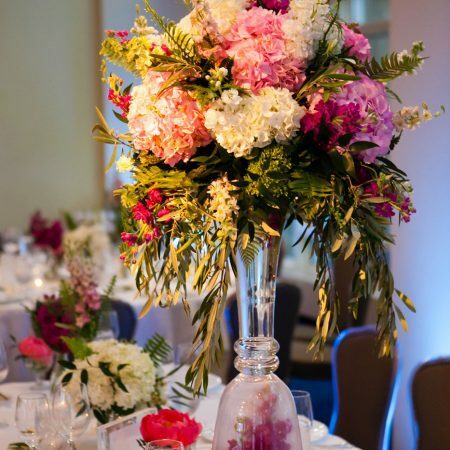 Peonies’ large heads are ideal to feature them as centerpieces. In addition, you can make them look exotic with the Coral Charm variety and adding other assortments of yellow and bright pink flowers to the arrangement. Wedding Cakes: The heads of the Peonies are big with vibrant colors, has a well-defined shape, and great staying power making it a great decor for wedding cakes. Whether it is peonies sugar blooms or real blooms, it gives you a beautiful texture and color to your confection. In 2015 there has been some new wedding trends that have been breaking through the traditional scene. Here are 4 big trends to follow for weddings happening this year. Rustic Chic – Lace and burlap has always been trendy over the years but now it has a new twist! Big fluffy peonies and sparkly linens are the new items to make your rustic wedding perfect. Making the venue seem more vintage but adding chandeliers instead of bistro lights have become more popular with this theme. Drone Wedding Photos and GoPro Videos – With the evolution of technology comes the evolution of wedding photos with this trend! You’ll be able to achieve your wedding photos at any angle, whether it be aerial shots of your ceremony or having a group shot of you and all of your guests. You will also be able to have more candid photos of you dancing at the reception, capture guests’ reaction as you enter the reception with the GoPro! Romantic Luxe – This trend is all about high flower content of romantic blooms such as hydrangea, roses and cascading orchids in creamy pastel colours. For brides wanting a clean, feminine, and softer look this theme is the way to go. Having an abundance of luxurious florals but avoiding foliage is key to making the flowers a statement piece at your wedding. Flower Crowns – In recent months beautiful floral crowns has been the new item for brides to wear on their big day! Whether it be made from delicate flowers like baby’s breath to fuller and bigger crowns made from mini-English garden roses, wax flower and lots of ribbon satin tails. This trend is perfect for the spring and summer time. Wearable flower crowns are romantic and a fun touch to add to your engagement photo!